These Caterpack Flexi Straws are made up of economical polypropylene plastic for low-cost durability and feature a concertinaed hinge close to the drinking end to provide a comfortable angle for the drinker. 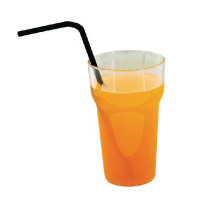 These straws are ideal for cold beverages such as soft drinks, mixed alcoholic drinks and cocktails. Measuring 210mm in length and 6mm diameter, and with a plain gloss finish, this pack contains 250 black straws.